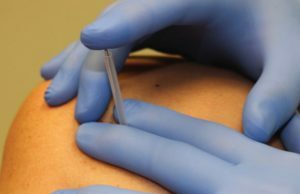 Dry needling is an effective treatment technique for soft tissue dysfunction and pain-related conditions. Dry needling utilizes sterile, solid filament needles to improve local tissue nutrition near the site of muscle or nerve injury. It can also be used to deactivate and desensitize knots in muscles that can contribute to pain, decreased flexibility and decreased muscle function. Dry needling allows the physical therapist to efficiently treat dysfunctions throughout a chain of muscles causing a painful condition. The only similarity to acupuncture is the use of a monofilament needle. Dry needling actually started with use of a hypodermic needle, except there was no infiltration or injection, hence the name “dry needle”. -Acupuncture is one aspect of a traditional Chinese medicine approach which includes diagnosis and clinical reasoning using various Chinese medicine assessment methods. Western or Medical acupuncture also aims to stimulate acupuncture points along meridians, but applies it to western medical reasoning. -Dry needling is a therapeutic intervention based on anatomy and neurophysiology with strong scientific evidence supporting effectiveness. The primary aim of dry needling is to needle altered or dysfunctional tissues in order to improve or restore function and facilitate healing. The needle used in the procedure is very thin, and most patients don’t even feel it penetrate the skin. The twitch response usually elicits a very brief (less than a second) painful response. The local twitch response elicits a very brief cramping and/or deep aching sensation. Some patients describe this feeling as a little electrical shock or cramping sensation. Dry needling may reproduce symptoms directly in the muscle being treated or may refer to other areas of the body. This is a form of referred pain, which is one of the hallmarks of trigger points. Elicitation of local twitch responses and recognizable referred pain is a good and desirable reaction because it confirms a possible source of dysfunction. In some cases, decreased pain and improved mobility is immediate. Typically, it may take a few treatment sessions for a lasting positive effect. We are trying to cause mechanical, biomechanical and neurological changes without any pharmacological means. Therefore, we are looking for a cumulative response to deactivate trigger points, disrupt pain and to restore optimal muscle function. Contact our office to schedule an initial evaluation appointment to determine if dry needling would be an appropriate manual therapy technique of treatment for your injury or condition. 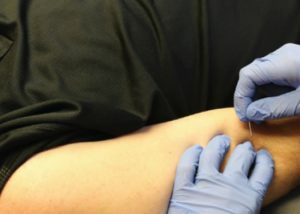 Dry needling utilized with other effective manual therapy techniques including soft tissue and joint mobilization and a good exercise program can be very effective in the treatment of musculoskeletal pain. Your therapist will work with you to understand your goals and develop a treatment plan to achieve those goals through physical therapy. Our treatments have an individualized, patient-centered focused. All treatments are one-on-one so you can expect to receive optimal care during each treatment session. Print and fill-out these forms to speed check-in.